It’s been a long time since I made Shammi Kababs at home. Kids and hubby love to have something different from the usual menu.It takes some time, but its worth the effort. Being a working Professional, I usually don’t find time to cook such an elaborate dish and hence it is a weekend affair. As you know ,I always try to experiment and cook something yummy and healthy for my family, which most of you are already doing. I would like to share this receipe with you. 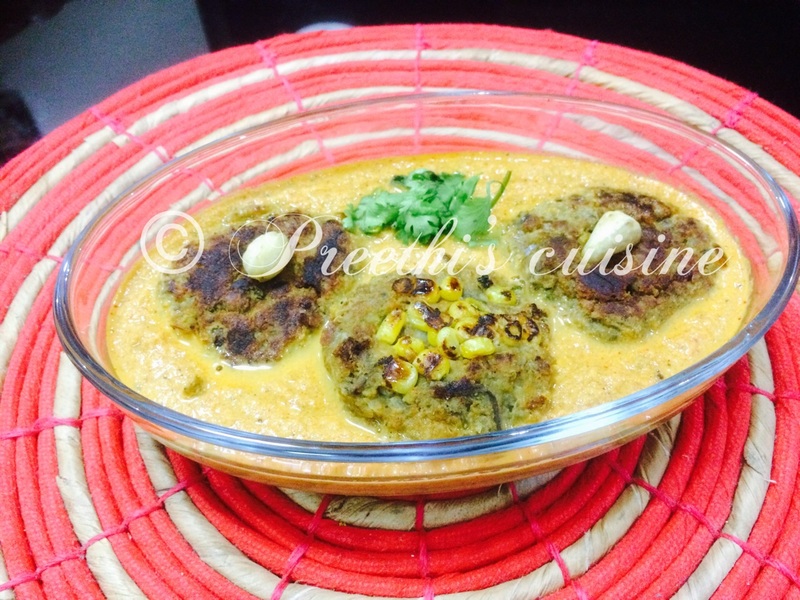 I bet that these melt in the mouth Yummy Kababs in a rich gravy will knock your socks off. Boil the bananas and mash them.Ensure there are no lumps. Boil 1 Cup of Channa Dal in ½ cup of water. Channa dal is to be soft but not soggy. Heat 2 tsp oil in a wok. Add Shahi Jeera. Then add green chilies and finely chopped onions.Roast till the onions turn slightly brown. Add red chilli powder,turmeric,chaat masala,coriander powder,garam masala and mix well. After 1 min add the boiled channa dal and roast.The dal has to blend well with the masalas. Add the mashed banana and chopped coriander . Add salt to taste. Ensure there is no water in this mixture .You can add 2 tsp of Roasted Gram flour powder/Besan in case you find the mixture a little soggy. Mix it well and switch off the stove after 8 mins. Allow the mixture to cool. Once the mixture is cooled ,grease your hands with oil , take some mixture and shape it into round discs. You can garnish with a cashew or fresh corn kernels in the centre. Place these dics in a heated pan. Drizzle some oil into the pan so that the discs don’t stick to the bottom of the pan. One the bottom of the discs turns reddish turn the discs. Once both the sides are done,remove from the pan and keep it aside. Heat a tsp of oil in a pan. Add Kashmiri chilli powder and 1 Tsp of Jeera. Add ginger garlic paste and saute for a few seconds. Add onions and roast till they turn slightly brown. Once the onions turn brown add the chopped tomatoes , green chilli, Corriander/Dhania powder,Pepper powder,khuskhus and cinnamon. Once the tomatoes turn mushy add the walnuts and coriander and saute for 5 mins. Switch off the stove and allow the mixture to cool. Once the mixture is cooled blend it into a fine paste. Heat a tsp of oil in a wok. Add a tsp of Jeera. Add the blended mixture. Let it simmer for 5 mins. Dunk the Kababs in this curry and serve hot with Rotis, Pulkas. I served this with Aachari Roti.